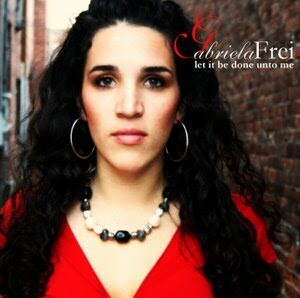 Gabriela Frei: Buy My CDS! I have TWO CDs now available for purchase! If you are old school and like to have a physical copy of CDs, you can visit my sales page at kunaki.com here. Kunaki is a great company that I have used to professionally produce these two CD. You'll have it delivered to you promptly. If you just want the mp3 files for your music player, you can purchase the entire CD or any songs you like on iTunes. Just search gabriela frei and you'll find me! My first CD is all original music, except the Ave Maria (by Franz Schubert). God has been so faithful in guiding me along my faith journey, my walk with him and towards him. These songs are the fruit borne of years of suffering and joy, challenge and surrender, failure and success. Be blessed! I am blessed to be able to share with you a piece of my heart through this album, a glimpse into my spiritual journey with the Lord. I pray it is a blessing for you as well. My second CD is loaded with traditional Marian hymns. We are so blessed to have such a lovely example of holiness and surrender in Mary. While my first CD gives praise to the Lord for all the good things he has done for me, this CD honors Mary as the pure vessel through whom God was born to the world. Her yes is to be our example. Her life is that of the perfect follower of Jesus. Her love guides us gently to the heart of her son. All glory be to God, forever and ever Amen.